Originating in South America, the Amazon is a loving and loyal parrot that is highly intelligent. Amazon parrots are highly loyal parrots that have exceptional vocal skills. They are very playful and known for their personalities that are similar to having a small human child in their capabilities and their temperament. They have excellent vocal abilities and do best with a devoted caretakers. More than most, the Amazons benefits from lots of attention and chew toys to keep them happy and healthy. 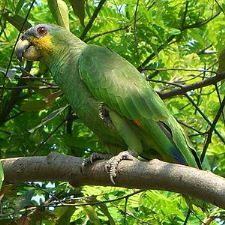 Amazon Parrots mix well with other parrots, especially conures, bond well with their owners, and make great pets for the RIGHT home. Probably the most important thing to consider when selecting a bird cage for an Amazon is the interior space of the bird cage as well as placement. They are larger birds and benefit from having a large cage. Another consideration is placement of the bird cage. Amazons like lots of interactions with their owners so choosing a bird cage which can be located in a high visibility area of your home is beneficial. Most experts recommend getting as large a bird cage as you can afford. As a rule of thumb, your bird should have sufficient room to freely spread both wings. 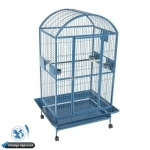 A good choice is to find a bird cage that is 36” wide, 24” deep, and 40” high (or larger). However if space is limited, a minimum cage size of 34” wide, 24” deep, and 36” tall would also work. In the wild Amazon are nesters so they are naturally inclined to chew on wood. Cages that accommodate extra space for destructible toys is a plus. Because Amazon’s like to socialize with their owners a bird cage that provides places to perch outside of the cage like a flight cage or play top is a plus. - Amazons prefer larger cages, minimum of 34" wide, 24" deep, and 36" tall. - They like to socialize with their owner for consider a high visibility area of your home.